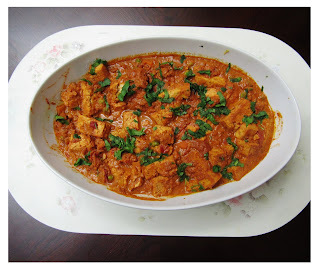 Indian Khana, Made Easy: Not Your Everyday TOFU!! I made some mango milkshake to eat with my tandoori tofu. It is a good blend of sweet and spice. I have tasted my share of different kinds of Indian curries before and let me tell you this...most of the ones you eat at North Indian restaurants like Chicken Tikka Masala and Chicken Makhani...tend to taste the same to me. They both have similar tomato based gravies that were cooked with the chicken. Been there, done that. Now for someone who is vegetarian, these curries wouldn't even be appealing. So what would they eat? Vegetarians I have chatted with have told me about Tofurkey and Tofu burgers which have the firmness of meat but are made from Tofu and seasoning. You know, that stuff still sounds Bland to me. I need flavor and spices. I'm not saying, I'm a full fledged Hot curry eater, but I like taste in every bite. My parents are vegetarian and they are always looking for ways to "spice" up their cooking with Indian and American ingredients. 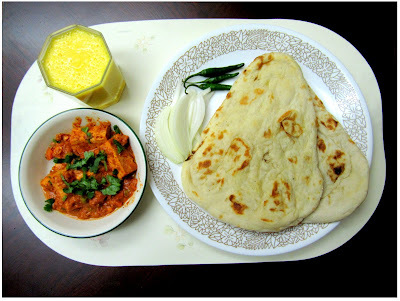 My mom decided to make Tandoori Tofu curry to eat with naan (Indian bread). I've had Tandoori chicken at restaurants where the chicken was marinated with the Tandoori spices and grilled, then served with onions and chilies...if you dared to eat them RAW!! We took the concept of mixing the Tandoori spices and marinating them with Tofu. The tofu sucked up all the juices from the Tandoori mixture and when eaten with naan, it was like I was swimming in a pool of flavor. The best part is that it fills you up and it's good for you. I couldn't wait to share it with everyone I knew...Hey, don't take my word for it, make it at home and let me know how it came out. 1. Remove tofu from its packing and drain the water well. Cut the tofu block into 1-1.5” cubes. 2. In a mixing bowl add yogurt, tandoori paste and mix well. Add the tofu pieces into the bowl and using a flat silicone spatula cover the mixture onto tofu. Marinate for 30min to 1hr. 3. Heat the oil in a saucepan on a medium flame. Add onions and sauté until they are golden brown, then add ginger garlic paste, chilli powder and mix well for 1min. 4. Add tomato puree and mix the mixture for 2-3 minutes. Transfer the tofu along with the yogurt into the pan, add salt and cook for 7-10min until the gravy thickens. 5. If you want to add more color, you can add frozen carrots and peas mix to the curry while its on the stove. Just before removing from heat, add some sour cream and mix well. Do not over mix the curry as the tofu pieces may break. 6. 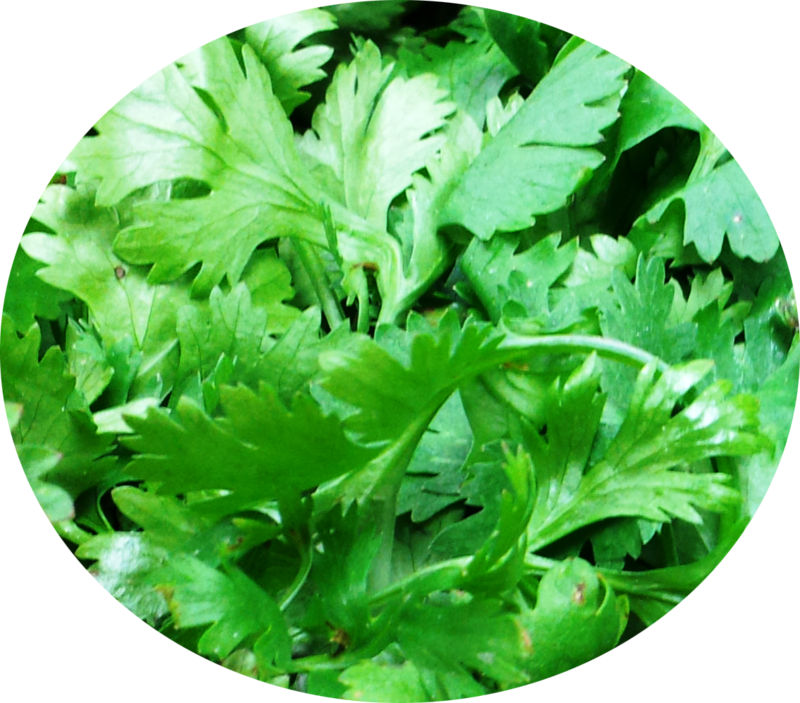 Transfer the curry into a serving dish and garnish with coriander. 7. 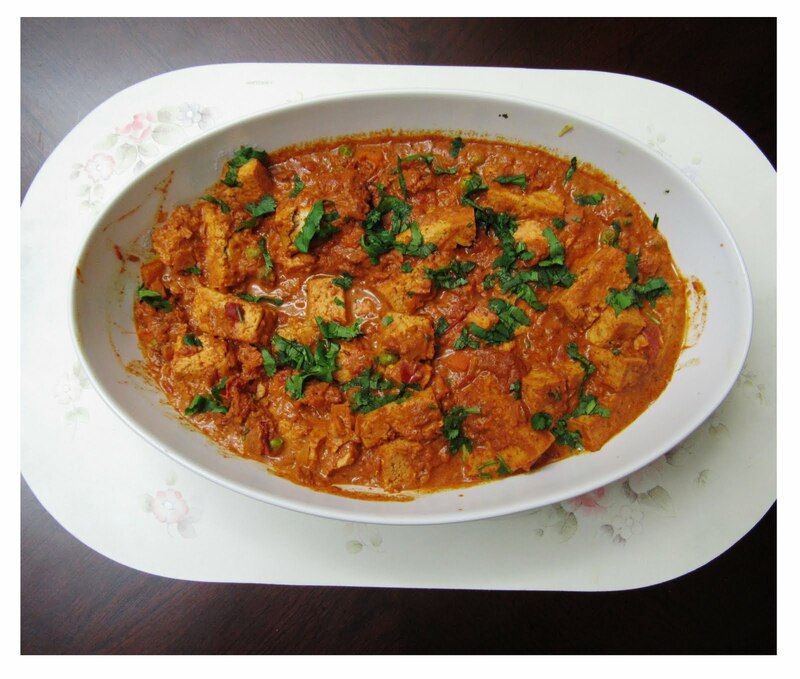 Serve the curry with naan, rotis or rice for a delicious, nutritious and scrumptious meal. Side additions of raw onions and green chilies will go well with roti or naan (typical north Indian style). Do you really eat so many whole green chillies? I've seen some Tandoori dishes served with fresh onions and chilies at restaurants. I would leave these for someone who wants to eat them. That was REALLY good. Thanks for sending me some. Nice Recipe. I am going to give it a try soon.. Question: Where do you get "steak" tofu? I found it in the refrigerated section of ShopRite and it is called Tofu Steak. Are you going try this recipe? It looks really tasty. Jahnavi, I am going to try this out over the weekend. Cant wait! It looks DELICIOUS! Nice. Let us know how it turns out. If you like, you can send pics to IKME2010@gmail.com and we can share it everyone.